Posted December 19th, 2013 by The Antique Register & filed under Travel. District 4 Councilman Tom Simplot and community members celebrated the installation of a new gateway arch across Seventh Avenue just north of Indian School Road late last year (2013). 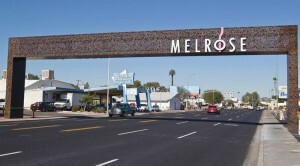 The arch adds a distinctive artistic element to one of Phoenix’s main arterial streets, and was constructed using an 80-foot steel truss structure with 24-foot columns. Lit at night, the sign’s decorative lettering mirrors Seventh Avenue’s distinctive curve in the Melrose District. 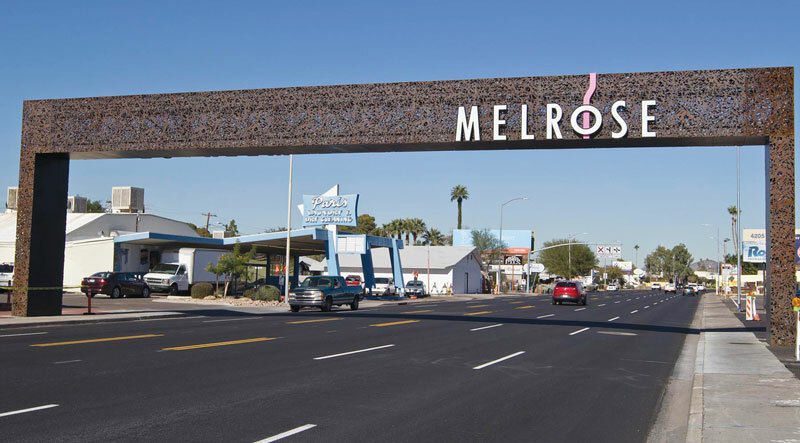 “The Melrose District and Seventh Avenue as a whole are two of the most vibrant, growing areas of central Phoenix. It’s an artistic and community hub and this gateway is a perfect way to celebrate its diverse identity,” said Councilman Simplot. The Melrose arch is made of half-inch steel plates, with decorative lettering etched in using a plasma cutter. All together, the truss and panels weigh approximately 43,000 pounds, with each column weighting 9,800 pounds. The Weitz Company was the contractor for the project with Gensler as the prime consultant and architect, and the firms of Aztec Engineering Group, Inc., PK Associates and Henderson Engineers serving as the design team.